Jamie Oil Company, Inc., is a full service home heating company specializing in home oil deliveries. Services include, but are not limited to automatic deliveries, fixed prices, 24/7 emergency service, budget saver programs, boiler, furnace, and central air conditioning service and repair, and more. Jamie Oil was founded in 1989 by Keith Proia of Framingham, Mass. Before he started the company, Proia had worked for his father Sam at the family business, Crown Fuel, which was also located in Framingham. The company was named after Keith’s newborn daughter, Jamie. Proia built his customer base quickly. He bought brand new oil trucks and built his reputation by offering quality work at fair prices. Unlike most upstart companies, Jamie offered full service 24 hours a day. By 1995 the company had over 1000 customers, most of whom were on automatic delivery. Company sales exceeded $1,000,000 for the first time in 1995. The company had five employees. Tired of the long New England winters and the grind of the oil business, Proia sold the company in the summer of 1997. The new company was headed by Tom Carey, of Hopkinton, MA. Carey had spent over fifteen years in the oil business. He started out working for the largest oil suppliers operating in New England, but always wanted to buy a local company. When Carey took over, the company had two oil trucks and four employees. 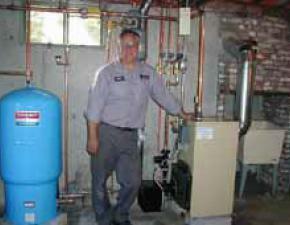 In 1997 the company began offering fixed price programs on heating oil to both homeowners and industrial accounts. Jamie Oil also began selling gasoline and diesel fuel. Soon the company was selling commercial fuel in New Hampshire. However, the primary line of business continued to be home heating oil and burner service in eastern Massachusetts. Jamie Oil then bought several competitors. HB Fuel, owned by Harold Brown of Marlboro, was the first in 1999. Then came Albies Oil Service, in 2000. Albies was established in 1932 by the Rousseau family. The company was located in the north Framingham neighborhood of Saxonville. In 2001, both Crown and Alan Fuel were acquired by Jamie. Alan Miller of Holliston worked with us up until he passed in 2015. Rick Auen brought over 30 years of experience with him when he joined JOC in 2000. As the company grew, so did the need to expand the JOC staff. Jamie was able to hire some of the most talented and experienced people in the field as other local oil companies sold to national marketers. In September 2000, Rick Auen of Hopkinton joined Jamie as the new General Manager. Auen worked for Terry for over 30 years, leaving as Vice-President/General Manager. Over the next two years Auen and Carey hired ten former employees of the former Terry and Trinity Oil companies, with an average of over 20 years of experience per person. In 2002, JOC was named “Best of Metrowest” for the fifth straight year. In 2003, Grant’s Oil of Hopkinton merged with Jamie and Dan Grant joined the new organization. Jamie also made their first delivery in the State of Maine in 2003. The company moved to their new office on Park Street in Framingham in July, 2003. In the fall of 2004, Ed and Al’s Oil Service of Ashland merged with JOC. Jamie now is able to store thousands of gallons of fuel in Ashland, a key distribution point for the company. Bruce Camille continues to be active with Jamie Oil. As the winter of 2004-2005 came to a close, Jamie Oil had a decision to make. Do we stay another year in the cramped quarters in South Framingham, or do we get more space to accommodate a growing operation? The Ashland location works well with Jamie Oil’s most recent addition – acquiring Ed and Al’s Oil Service in September of 2004. Most of Ed and Al’s customer base is located in Ashland, and Jamie Oil’s growing distribution in Hopkinton and surrounding towns has contributed to the decision to move to Ashland. “We will always be a Framingham area company.” said JOC president Tom Carey. In 2009 Howie Oil, a Millis based company with over one thousand customers, merged with JOC. The deal included Howie’s vast oil storage facility, which can hold up to one hundred and forty thousand gallons of heating oil and diesel fuels. This move greatly enhanced Jamie Oil’s ability to purchase and store oil more economically. In the summer of 2012, Tony Borelli of Grafton, who had spent the previous ten years as General Manager of Superior Oil in Milbury, became the new GM of JOC, replacing Auen, who retired. Under Borelli’s leadership, the company built one of the best Air Conditioning Service departments in Eastern Massachusetts. Borelli picked up where Auen left off, hiring experienced technicians that he already knew and expanding and improving the organization’s product line and reputation each and every day. In November of 2013, JOC announced an investment in a home heating oil business located in southern Maine. In 2014, the company reached an accord with Metrowest Oil Service, whereby JOC would provide emergency service to Metro West heating oil customers. The arrangement continues to be in effect today. In August 2015, with the company running twelve oil trucks, employing over forty people, and over six thousand customers, Jamie Oil was voted the #1 Home Heating Oil Company in an independent poll published in the Metro West Daily News. This marked the eighteenth consecutive year JOC received the coveted honor. Over the past twenty-five years, our winning formula has not changed: Hard work, fair prices, outstanding quality and satisfaction guaranteed has put us where we are today.